Meet two alumni who have stretched their careers and hobbies beyond health care. Louis Velazquez’s medical and military careers have taken him literally from coast to coast, but it was easing into retirement that put him on a new path: brewing beer. Velazquez, PA-C’92, joined the Coast Guard at age 20 and was a flight medic and rescue swimmer until the Guard sent him to school to become a physician assistant. At the time, he was the chief of health services for the Coast Guard in Alaska. After graduating from DMU, Velazquez continued his Coast Guard service, first in New York and then in Washington state. When he retired from the Guard in 1996, he and his wife, Brenda, chose to move closer to family in the eastern United States. They landed in Ahoskie, a town of approximately 5,000 people in northeastern North Carolina. For 14 years, he worked with a “great group” that provided house calls, nursing home calls and clinic and hospital care. In 2009, he joined an emergency medicine group in nearby Windsor, where he worked three to four 24-hour shifts per week followed by a week off. After much experimentation and with feedback from “a lot of subjects willing to try my beer,” Velazquez decided to submit two of his brews – an amber ale and a lemon wheatgrass beer – to the North Carolina State Fair’s beer competition. The effort paid off: His beers won blue ribbons. The fact that it did inspired Velazquez to consider commercial brewing. He did a “lot of field research,” talked with other brewers and completed a mini-course on the chemistry of fermentation through Appalachian State University. 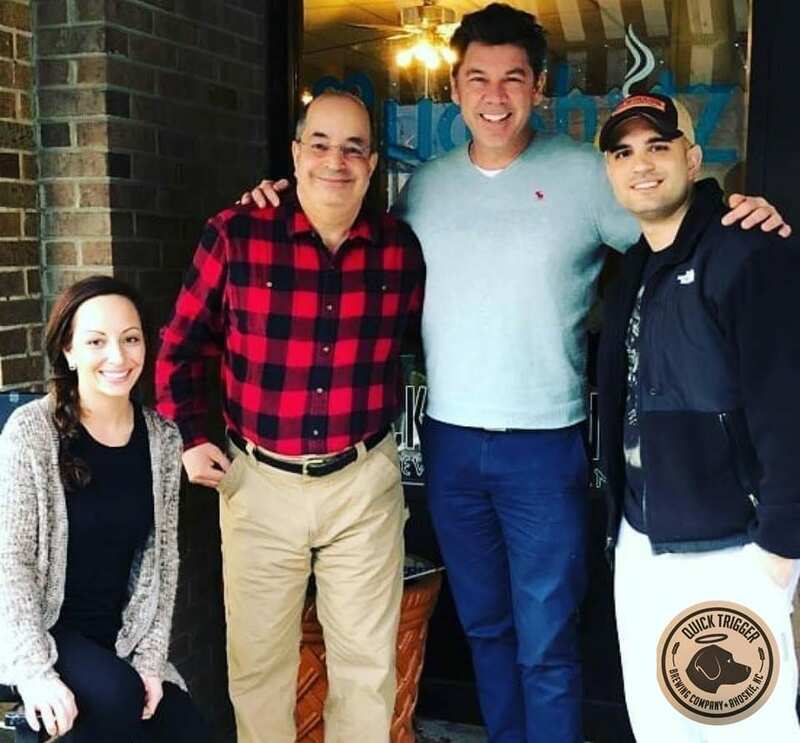 The transition from home brewing to commercial production is expensive, but he had an advantage: He and Brenda have owned Mug Shotz Café, which she manages day to day, in Ahoskie since 2002. It had space to accommodate the new operation, so in 2017 Quick Trigger Brewing Company was born. Quick Trigger Brewing Company specializes in Belgian ales, saison, blonde ales, fruit and vegetable ales as well as American pale and imperial pale ales. “We try to provide variety, from pilsners to something heavier, like our chocolate porter, as well as seasonal selections,” Velazquez says. The brewer likes to experiment. He recently bought red wine barrels from a local winery to make sour beer. “It’s fun work. I tell our staff it’s like being a chef,” he says. Velazquez, who was the 2007 Alumnus of the Year of DMU’s College of Health Sciences, also wants Quick Trigger to contribute to the local economy. The enthusiastic reviews on its Facebook page – which praise its brews, food, staff and atmosphere – indicate that it is. Richard Miles, D.O.’92, gives customers a wide variety of products in a fun environment. His business also supports charitable and other events in his community. An injury led Richard Miles, D.O.’92, to become a business owner. The medical director of Merit Health Central’s emergency department in Jackson, MS, had to take time off work in 2009 after he had surgery for a bicep injury. That coincided with two other events: His wife, Trayce, was looking to land a part-time job after being a stay-at-home mom, and a beer store he shopped at in nearby Madison was going up for sale. The couple decided to buy it. “The biggest thing was that Trayce was willing to be the manager of the store and manage its day-to-day business,” he says. In 2014, Miles opened a second store in Fondren, Jackson’s trendy arts district, and closed the Madison location in 2017. 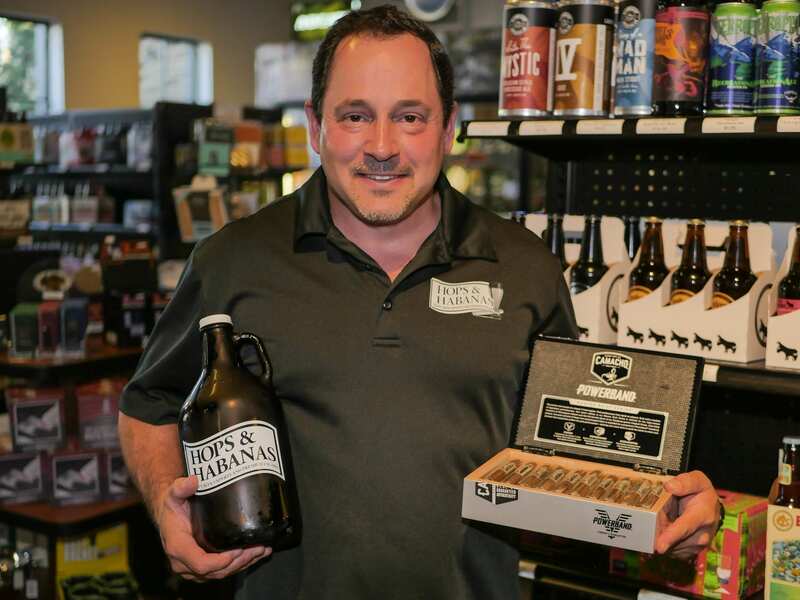 Hops and Habanas now offers 24 beers on tap, more than 550 kinds of craft beer and nearly 530 cigar brands in its walk-in humidor, along with pipe tobacco and hookahs. Patrons enjoy live music along with food and drinks in its indoor and outdoor seating. Hops and Habanas also supports local events, such as Zoo Brew and the Mississippi Craft Beer Festival. He also joined a movement, Raise Your Pints, to loosen Mississippi’s restrictive beer laws. In 2012, Mississippi became the last state in the nation to raise the allowed alcohol content in beer from 5 percent to 8 percent. That has opened doors to more independent breweries in the state. Miles got interested in medicine thanks to his mother, an xray technician who worked in a hospital in Ontonagon, a small town in Michigan. He also was a Boy Scout. “The first thing you learn is first aid,” he notes. After graduating from DMU, he served as a doctor in the U.S. Army, including a stint as a flight surgeon in South Korea. He then worked at Mercy Medical Center in Des Moines until taking his current position with Merit Health. Miles has no moral dilemma with being a physician who sells cigars. “Cigars are not a habit; they’re a lifestyle,” he says. “Most people who enjoy them smoke fewer than two a month. It’s a recreational thing.